When I was first introduced to Emma and Scott’s story I had a very deja vu moment. In fact I had to double check the couples names as I really thought I was reading the story of how one of my best friends had first met her husband. Any way I digress. Today’s wedding has some of the most beautiful styling I have ever seen in a barn! Beautiful rustic floral displays, pretty pastel bunting, loads of fairy lights and all brought to life with the most fantastic photography! What really struck me with Emma and Scott was their desire to make sure everyone shared some part in their special day, holding a wedding in both New Zealand and back here in the UK, to make sure their most nearest and dearest could celebrate with them. Their first ceremony was held in New Zealand so it was only right that parts of that were included back home. In honour they had the best bottle labels made up, using an image from the original ceremony, along with the cutest surprise from Emma’s brothers, which featured a video of sweet messages from their family and friends back in New Zealand! “Scott and I met whilst I was working in a local pub in Kirkby Lonsdale. He was over from New Zealand to play rugby. After several years of long distance love and living together in both of our home countries scott proposed to me on a beach in New Zealand. A year later my close family and I flew out to New Zealand to get married at Scott’s parents beach house. We married under a driftwood arch handmade from our pickings off the beach from the previous day. The setting was perfect and the weather a barmy 36 degrees. I wondered how I could ever re create it in the UK for my own family and friends. Already being married gave us a more laid back approach to an English ceremony. I’d seen a number of venues but when my friend suggested using one of his unused barns I was so excited about the possibilities. It allowed us to have full control over the decoration and style of the wedding. I wanted it to be rustic but still elegant with an English charm. My Friends and family all helped to create the venue. My mum became my wedding planner, My dad spent days hanging lights and bunting, My cousin folded hundreds of paper cranes and one of our friends made loads of fudge for favours. We had a second barn which was used as the bar which Kirkby lonsdale brewery supplied. They bottled beer some of their beer for us with personalised labels showing pictures from our Nz wedding. After a trip to york with mum and gran and no real idea of what dress I was after, I bought my dress from brides of York by the designer Cymbeline. It was a very lightweight soft lace fitted dress, perfect for beach and barn. My bridesmaids dresses were deep navy blue bought from ghost in two different styles to suit each of my four bridesmaids. Scott wore the suit he’d bought in New Zealand. Sadly none of Scott’s groomsmen could make It over to the UK. I didn’t have a colour scheme but as the bridesmaids dresses were so dark I opted for a messy bouquet full of colour and multi coloured bunting. I designed the invites, order of service, menus. As a wedding photographer myself the photographs were a key part of the day. I found James and Lianne on the internet and was immediately drawn to their images. On the day they were absolutly great. Their unintrusive relaxed style was just what we wanted. They took us off to a local sawmills where we got some portraits of the two of us which we love. I would highly recommend them! Love the floral headdress for the evening time look ! Congratulations guys ! Hunter Wellies to go with a countryside wedding! Love it! 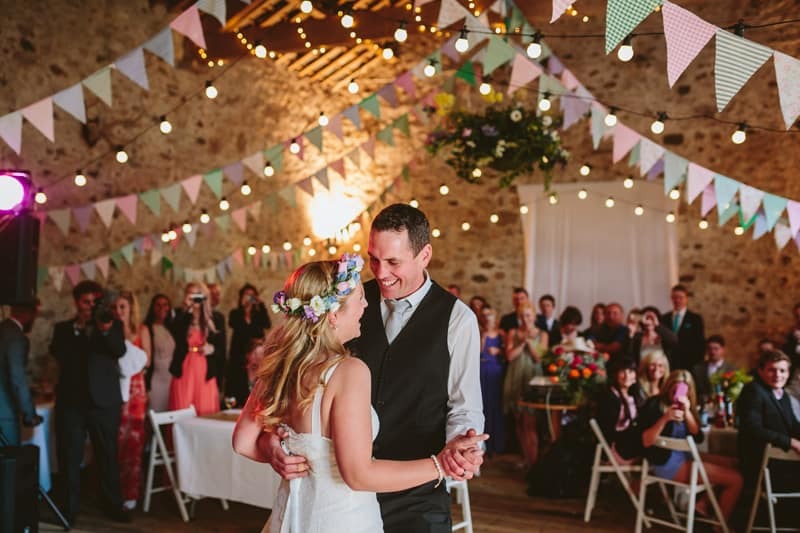 The multi-coloured bunting and fairy lights look fab too! I am getting married in a converted barn in Cheshire next year and I can’t wait to recreate some of these great ideas. I am also looking into hiring some additional lighting and I am considering our initials in large light up letters!